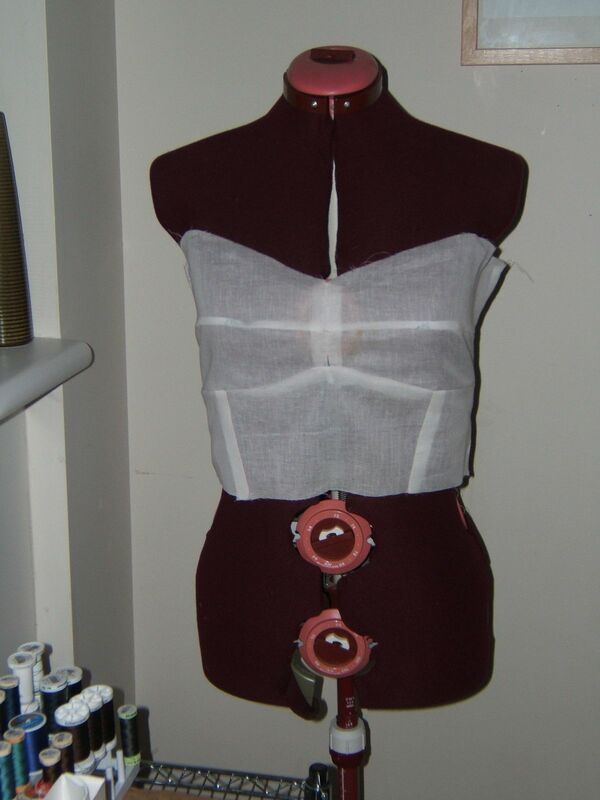 vogue 1174 – bodice muslin done! Oh – the dress is inside out on account of me putting the zipper in inside out – so that’s the lining you see! Looks good that way too! I do think I’ll add that extra half inch or so on the top; I do feel, now that the dress is on the body, quite exposed. I’m particularly sensitive about the extra fleshy bits right at the underarm. I generally find strapless quite a nice silhouette on me, but do feel sensitive about the top cutting into that underarm flesh. I’m planning on adding back another full inch or so all around the top, and simply taking in the seams a little (or the zipper…) if it’s too large. (I’m fearing back-fat muffin top if it’s too tight…) While many bloggers have said that this dress runs big, others have said that once they’ve made it up and are wearing it for an evening, they have little room to breathe and eat. I’m wanting to hit the sweet spot in between those two. 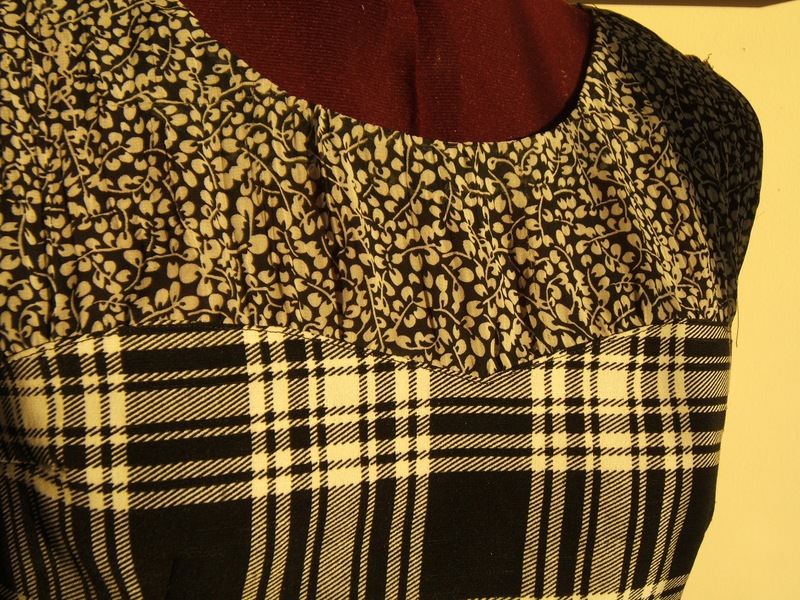 I’m also thinking of adding an extra half inch lengthwise to the upper bodice. On the dress form, the upper bodice sits quite high on the chest, but my upper torso is longer than the form’s. I think I’ll feel more secure with an extra bit of fabric at the top, and a half inch won’t change the style too much. 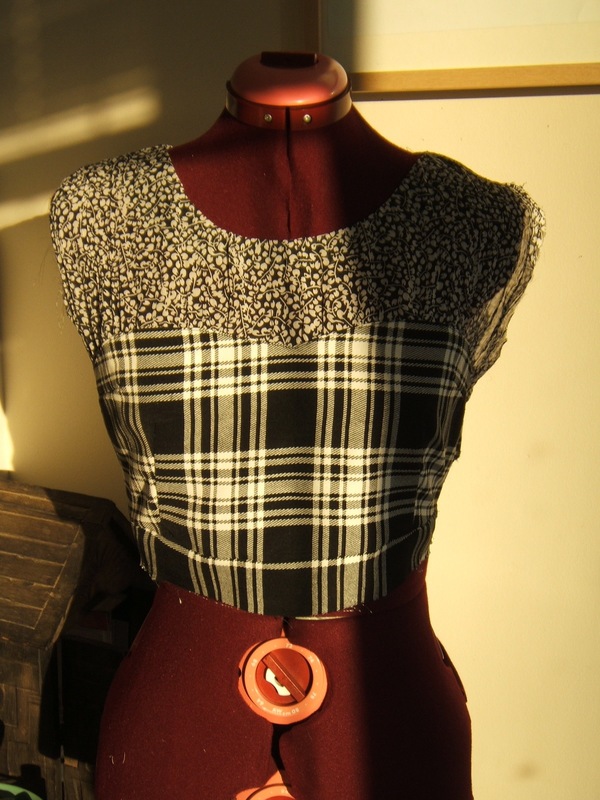 This bodice – with 9 pattern pieces – is tricky enough to adjust on its own. The pattern pieces for the lining and foundation (also now needing adjustment) are completely different! I think I’ve got them correctly adjusted to fit. This muslinette is fully lined, and everything fit; I’ll also add the foundation – and maybe the boning. Good to get a bit of practice with that before moving on to the ‘good’ fabric. I’m wanting to get the bodice muslin done by Friday, so that I can get the good version slowly stitched together through the next week. (though i’m also making tacos for 20 that night… oh ambition). The funny thing about this dress is that it seems to be more fiddly (with the seamlines) than difficult. Lots of pieces, but not any particularly difficult techniques – at least not yet. I’ve found 1161… *almost finished*… much trickier. Some of the *9* pattern pieces are the same no matter which pattern size you’re making; others are larger or smaller, depending on which size you are making. When making pattern adjustments, alter the pieces that change. It just seems to be the most straightforward solution. Sometimes, you cut out two pattern pieces only to stitch them together. Read pattern directions to anticipate when this happens, and just stitch them together as soon as they’re cut. Much more efficient that way! I was hoping to get to this point by the end of the week! But without better ideas for how to spend my day, I finished tracing 1174, and cut out the bodice muslin. It was so quick and easy I decided to stitch it up! I even prepped my fashion fabric for good measure! I’m liking how things are looking so far! By Vogue’s measurements, I’m a 14, and sewed up a 12. Turns out that is looking a bit big on my form – see that nice gaping near the left armhole? I’ll have to get my sweetie to pin me into it to see how it works on a real life body (I think I’ll skip posting pics given how sheer my muslin fabric is… they’d be pornographic!). Sadly, 12 is the smallest size in my envelope, and I’m not keen to pay Vogue patterns pricing to get a 10. $33 in Canada! Bah. Many other sewists who have given 1174 a go have commented that the sizing runs big. Given that this muslinette represents just one layer, I’m wondering how much I should take in. After all, there’s still lining and a foundation with boning to fit inside. I wasn’t planning on muslining the lining and boning – though it might not be such a bad idea given that the boning is a new to me technique. Though perhaps I can just get an extra metre of boning and practice on some muslin. I’ve also discovered what seems to be the trickiest part of this pattern (minus the boning, and keeping 27 pattern pieces organized): the seamlines. I think they’re all going to be piped, and so if they don’t all match up, the dress is going to look pretty rough. One of my side seams wasn’t matching up… will have to compare my traced pattern piece to the original to see if I accidentally added or took a little off of any piece. The other tricky bit – I’m using a print, and so I need to make sure that the print matches on all sides. It doesn’t have horizontal stripes… thank goodness… at one point I was daydreaming of making this in a plaid… what a nightmare that would have been! but I still think they should line up reasonably with each other. when tracing, use the side of the paper for the fold. less to cut! when sewing a plain fabric, make sure I know which is the up side, and which is the down side to a piece. I think I sewed two upside down by mistake! 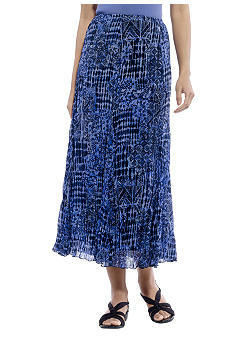 I have 25 days to get a good looking Vogue 1174 made for a wedding at the end of the month. At first, I was thinking, well, it’s just a dress. a time consuming dress, but just a dress. Then I started tracing the pattern. 27 pieces. With 16 pieces traced, and 11 to go, I’m already a little overwhelmed. This dress is a bona fide project, and I’m going to have to set myself some milestones. Tomorrow I’m hoping to finish tracing the pattern and start cutting the muslin. 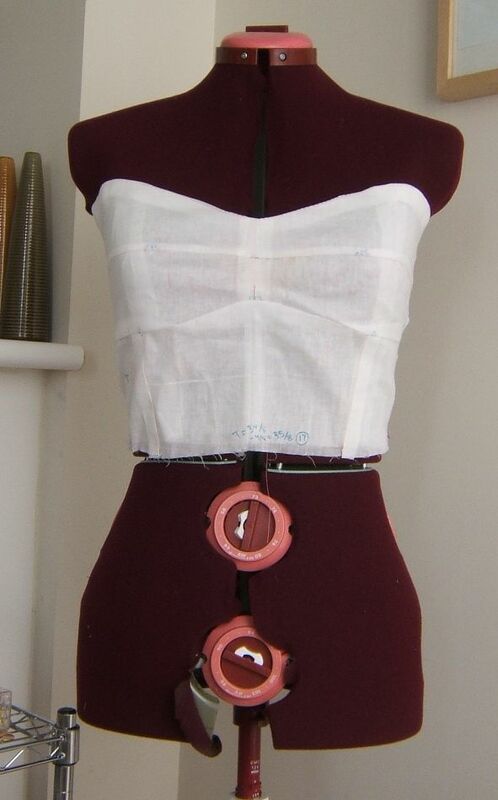 If I can get the bodice muslin done by the end of this week, I’ll be happy. Beginning 1174 means that my Colette Macaron – and my two Negronis – are sitting pretty in my UFO pile, along with a long UFO Vogue 1161. Macaron is a heartbreaker of a UFO. I got rid of the sleeves, and made up some bias tape to finish the armholes. Then I re-cut the midriff, in a black poly shantung underlined with a nice heavy-ish satin, and re-attached it to the bodice. Somehow, it’s smaller, and I had to take the pleats in on the skirt (after having to take them out earlier). Now, I’m not sure it’s going to fit when I put the zipper in – or if it does fit, it’ll be *really* tight, but just under the bust, at the widest part of my ribcage. I’ve already cut my seam allowances down to 1/4″. Lesson learned – muslin. Now I fear I have a home-sewn version of “skinny jeans” – the ones you might diet in hopes to get back into. Colette Macaron sleeves – should they stay or should they go? Perhaps I should really start to heed what ‘they’ (oh mom’s favourite anonymous ‘they’) say about expectations… you get the expectations high, and you’ll likely feel disappointment. As I admit to feeling with this Colette Macaron. It’s hard to admit that I’m on the fence about a lot of Colette’s stuff, because I *want* to like it so much. I’m just not sure it’s my style. But I had seen a few Macarons that I thought were pretty cute. 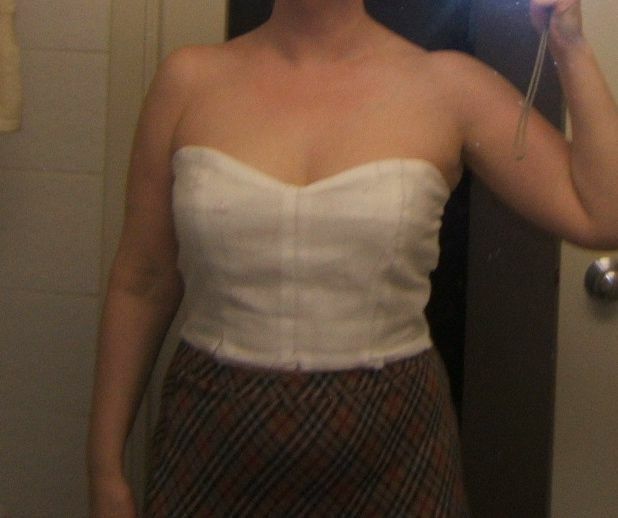 And after I put the bodice together, I was absolutely swooning. But as for my almost- finished Macaron? I’m not sure. Given where the pleats landed, the white horizontal strips are now really dominant. I’m thinking of switching out the midriff for a solid black to darken it, but would three fabrics be too much…? But my biggest question is about the sleeves. I worry that with them there, the dress makes a quick detour to primville. It’s in part because they are eased in, and given how things worked out, there is a bit of a gathering effect (oooh… i so don’t like gathering…). I was most excited by the bodice before I attached the sleeves on. (And I can’t overemphasize how I labored over those crinkly, fussy, and fraying sleeves.) And so I’m wondering… Macaron sleeves – should they stay or should they go? I may have been quiet on here since my last update 2 (!?) weeks ago, but the sewing machine has been a-buzzing. I’m finishing the last two of four Colette Negronis for my sweetie. I’m batch sewing those, and timing myself. So far, it’s been 20 hours of sewing time – ten hours per shirt. But all I have left are the cuffs, side seams, buttons, and hems. And I’m finally getting my edgestitching down. woot! I was completely inspired by a similar plaid/floral dress by Versace that I saw a few months ago in Vogue; the plaids/florals were in a beautiful royal blue, and it also has a sweetheart neckline with the lighter attached bodice. I immediately thought: Macaron, and started hunting down the fabrics. These I got at Fabricana in Richmond, and until I stitched them together, I wasn’t sure if I would like them… like, I was really reticent, and several times thought about going the safe route with the floral up top, and a medium-weight soft denim underneath. But I am So glad I did the plaid (rhyming not intended but realized). I love these together, and I can’t wait to wear it out! Yup that’s a crinkle fabric up top, which I bought before ever thinking to myself, it’s a crinkle fabric. 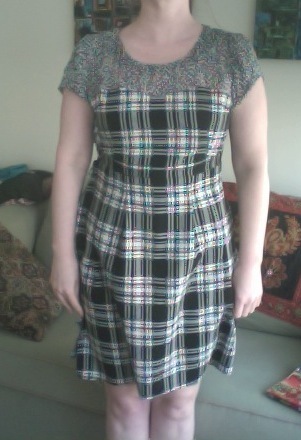 I was (a) crazy scared of sewing it, and (b) crazy scared it would look very 90s broomstick skirt/Elaine Benes. I get that the Elaine look is back in, at least in some circles, but… no. just, no. But it’s been going alright. I put some staytape over the crinkle fabric’s seamlines to make sure those crinkles don’t stretch out, and every few stitches, I lift the presser foot and re-adjust the fabric, just in case. and I Love how the fabric texture and weights contrast! This is also my first major project, at least in a while, without a muslin. And of course I cut a size smaller than I should have! I’ve had to take fabric out of the darts, as well as the seam allowances. And pledge to hit the gym. Two New BC Pattern Companies! Do I like shopping more than sewing?